Solar energy is abundantly available globally, but unfortunately not constantly and not everywhere. One especially interesting solution for storing this energy is artificial photosynthesis. This is what every leaf can do, namely converting sunlight to chemical energy. That can take place with artificial systems based on semiconductors as well. These use the electrical power that sunlight creates in individual semiconductor components to split water into oxygen and hydrogen. Hydrogen possesses very high energy density, can be employed in many ways and could replace fossil fuels. In addition, no carbon dioxide harmful to the climate is released from hydrogen during combustion, instead only water. Until now, manufacturing of solar hydrogen at the industrial level has failed due to the costs, however. This is because the efficiency of artificial photosynthesis, i.e. the energy content of the hydrogen compared to that of sunlight, has simply been too low to produce hydrogen from the sun economically. Photovoltaics (PV) is a method of generating electricity by converting solar radiation (sunlight) into direct current electricity by using semiconductors that exhibit the photovoltaic effect. These semiconductors are also called solar panels and are composed of a group of solar cells containing a photovoltaic material. Materials presently used for photovoltaics include monocrystalline silicon, polycrystalline silicon, amorphous silicon, cadmium telluride, and copper indium gallium selenide/sulfide. Due to the growing demand for renewable energy sources, the manufacturing of solar cells and photovoltaic arrays has advanced considerably in recent years. 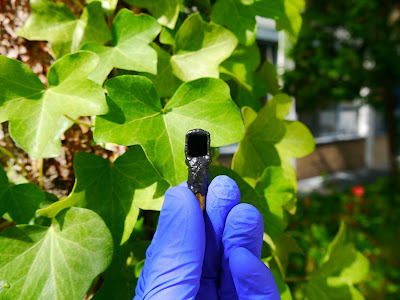 Combining the two processes a photoelectrochemical cell can be produced that will harness sunlight to generate chemical fuel, specifically by splitting water to generate hydrogen. Scientific facilities worldwide have therefore been researching for many years how to break the existing record for artificial photosynthesis of 12.4 %, which has been held for 17 years by NREL in the USA. Now a team from TU Ilmenau, Helmholtz-Zentrum Berlin (HZB), the California Institute of Technology as well as the Fraunhofer ISE has considerably exceeded this record value. Lead author Matthias May, active at TU Ilmenau and the HZB Institute for Solar Fuels, processed and surveyed about one hundred samples in his excellent doctoral dissertation to achieve this. The fundamental components are tandem solar cells of what are known as III-V semiconductors. Using a now patented photo-electrochemical process, May could modify certain surfaces of these semiconductor systems in such a way that they functioned better in water splitting. "We have electronically and chemically passivated in situ the aluminium-indium-phosphide layers in particular and thereby efficiently coupled to the catalyst layer for hydrogen generation. In this way, we were able to control the composition of the surface at sub-nanometre scales", explains May. There was enormous improvement in long-term stability as well. At the beginning, the samples only survived a few seconds before their power output collapsed. Following about a year of optimising, they remain stable for over 40 hours. Further steps toward a long-term stability goal of 1000 hours are already underway. "Forecasts indicate that the generation of hydrogen from sunlight using high-efficiency semiconductors could be economically competitive to fossil energy sources at efficiency levels of 15 % or more. This corresponds to a hydrogen price of about four US dollars per kilogramme", says Prof. Thomas Hannappel, from the photovoltaics group at TU Ilmenau, who was academic advisor for the work. Prof. Hans-Joachim Lewerenz from the Joint Center for Artificial Photosynthesis at the California Institute of Technology, who worked closely with May, said:"We are nearly there. If we are successful now in reducing the charge carrier losses at the interfaces somewhat more, we might be able to chemically store more than even 17 % of the incident solar energy in the form of hydrogen using this semiconductor system".